Shelley is a clean(ish) eating & cooking fro-yo lover with California roots and a gypsy soul. 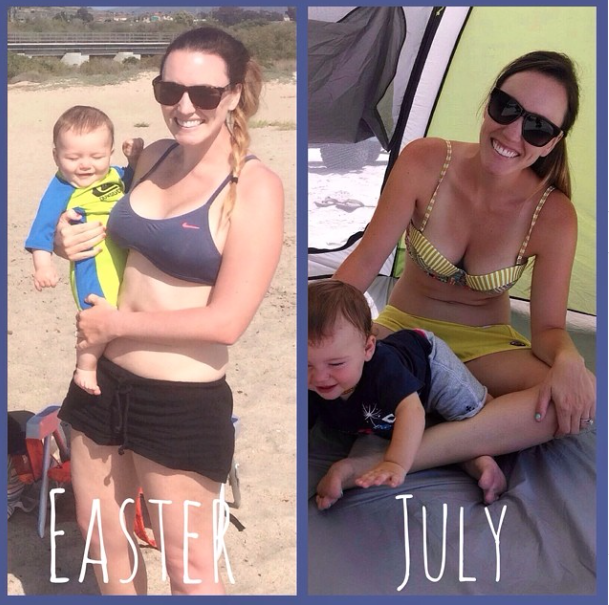 Looking to drop her final baby weight post-partum, Shelley found a passion for fitness and adapting recipes to make them healthier, cleaner, and leaner. With a background as a small business owner & an event coordinator, Shelley has always had an eye for details. Taking her styling background from event & hospitality world, she loves tailoring her food presentations to tantalize one’s taste buds through a picture. “Since my audience can’t smell a recipe or photo, I want them to see a picture worth a thousand whiffs!” She believes all good things can still be enjoyed, in moderation, and occasional cheat meals are a must for the body and soul! Shelley believes life is meant to be explored with a wanderlust spirit, whether through travel or in the kitchen. Hi! I’m Shelley! It’s just me holding down a little beach fort with my sweet little munchkin, Tanner. Welcome to a little slice of my world, where I’m enjoying the ride with my 2 1/2 year-old wingman! I grew up in Northern California, earned a Bachelor of Science, with honors, from California State University Chico in Recreation Administration – Tourism – and Event Management, and a mini degree in Public Relations & International Event Planning from Massey University in Palmerston North, New Zealand, where I studied abroad during my junior year of college [and almost never came back]. I accepted my first job out of college when I was recruited by Marriott International, the Vacation Club branch. They presented five cities/states I could choose from, & I let them chose my fate! I ended up in Park City, Utah, and it was one of the most fun, magical experiences of my life! From there I was promoted within the event department, and moved to Pacific Beach, San Diego, and worked as an Event Concierge at the JW Marriott Marquis in Seaport Village. I learned SO much, and eventually had the knowledge and courage to open my own wedding & event planning business, Better Half Weddings & Events, when the wind blew me to South Florida a year later. With an entrepreneurship background, Coastline Pressure Cleaning, Inc., was born, a commercial and residential pressure washing company serving most of the state of Florida and almost all Wells Fargo branches from Jacksonville to the Keys. Obviously pressure washing was never a passion of mine, but it taught me a ton about launching (another) business, especially grass roots marketing, strategizing, and organizing. That combined with my years of experience in event management, I can’t help but to always be thinking about what’s next…eventually Koru Retreat, a wellness retreat weekend for women was born, and my Coastline and Better Half days have since been retired. In August of 2013 the true love of my life was born, Tanner Kai. I never realized how becoming a mother makes you full of so much life, love, and protectiveness. Like overnight you become a mama grizzly bear who wants nothing but the absolute best for their little cub. Growing up in California, I knew the golden state was where I always wanted to raise a family. Although life didn’t exactly go as planned, I’ve learned to go with the flow and that everything happens for a reason. When one door closes, we just have to know another will open soon. Each day might not always be a good day, but there is good in every day. As long as we’re surrounded by friends, family, and laughter, we can do anything. We can survive. Family isn’t a number, it’s a feeling, a sense of home, pride, and love. After Tanner, I found my true passion; health & fitness. At 8-months post-partum, I looked in the mirror and said “who the heck are you? !” None of my clothes fit – not even my pregnancy clothes! Umm…no. Not okay. I decided right then and there it was time for me, and time for a change. Because of that, I was no longer afraid to work out, and noticed my milk supply actually increased due to all the healthy things I began to eat and the amount of water I upped throughout my days. 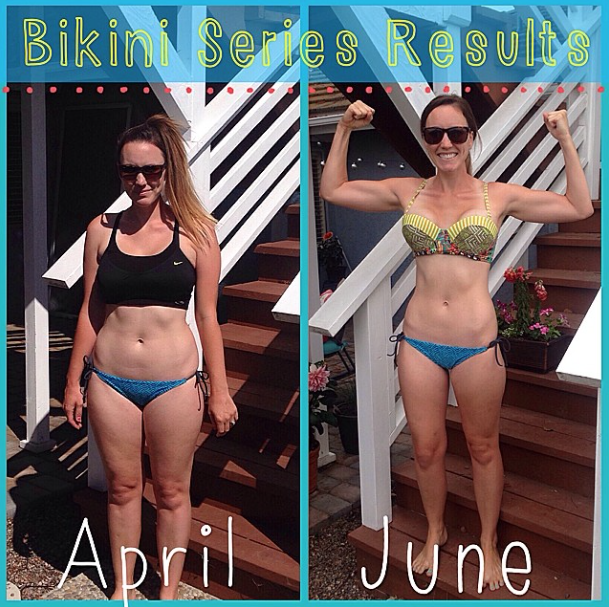 I joined Tone It Up in April of 2014, at the start of Bikini Series. Since then I’ve lost countless inches and got my pre-baby body back, better than it was before. A totally annoying cliche – but I truly gained so much more than a lighter number on the scale or smaller pant size; I found my zest for life again, my heart and soul got a recharge, and I’ve never felt so at peace with my life. I’ve gained a strength in my body & my mind from the Instagram fitness community I didn’t even know could exist. I’m so grateful for the path I’ve been down, and how my social media “family” has been there for me through my journey thus far. [Find me on Instagram @seashellsandsitups]. I’m completely humbled every single day with how my Instagram, and brand, Sea Shells & Sit Ups, has grown SO much in the past year. It’s unbelievable to me, as I’m just a normal, regular ‘ol girl next store. With over 35k social followers combined, it’s an honor to just be Shelley – just sharing my life one Instagram photo, caption, story, quote, recipe, toddler/mom-life, adventure…at a time. My cousin Ashley, was visiting La Jolla from South Florida for a work conference, and I went to visit her (& take her to buy her a cooler to ship back all her pumped breast milk, of all things; the sacrifices we breastfeeding mamas make for our littles!) for the afternoon. I couldn’t get over how fantastic she looked, so, naturally, we began talking about what she did to lose her baby weight. 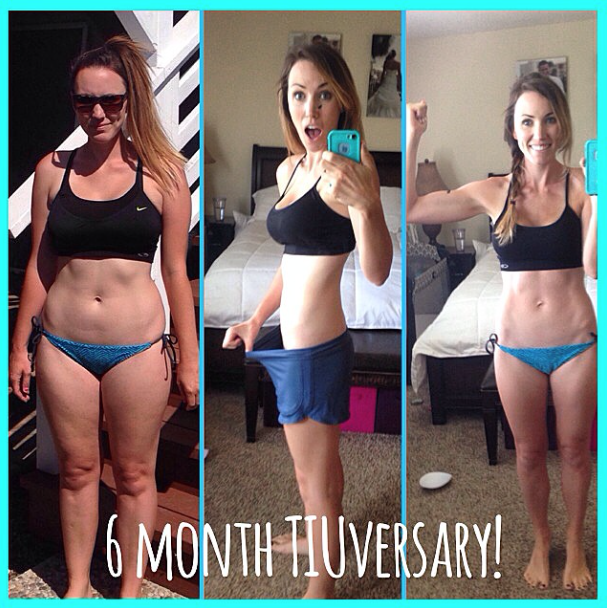 She told me ALL about the TIU lifestyle, and the two adorable trainers, Katrina & Karena, who run the show – Tone It Up. I now combine my own workouts, TIU workouts, Kayla Itsines workouts, and a variety of other random fitness programs. 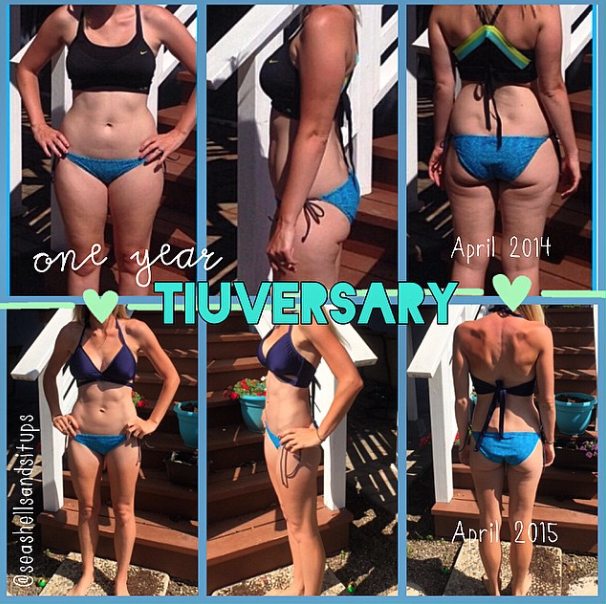 A couple months later, she was looking for an accountably partner for an 8-week workout series they were starting called the TIU “Bikini Series,” Being 8-months post-partum, I finally felt ready to (slowly but surely) start getting my pre-baby body back. I had to have a c-section because of back injuries (4 herniated & building disks in my tailbone), and believe it or not, it literally took 8 months to be pain/numbness free from the surgery. There was absolutely NO way I could have started a workout program before then…so if you’re a new mom and reading this, PLEASE be gentle on yourself. It took you nine months to cook up that sweet little human, it’s okay if it takes that long to feel ready to start thinking about you & your pre-baby body again. 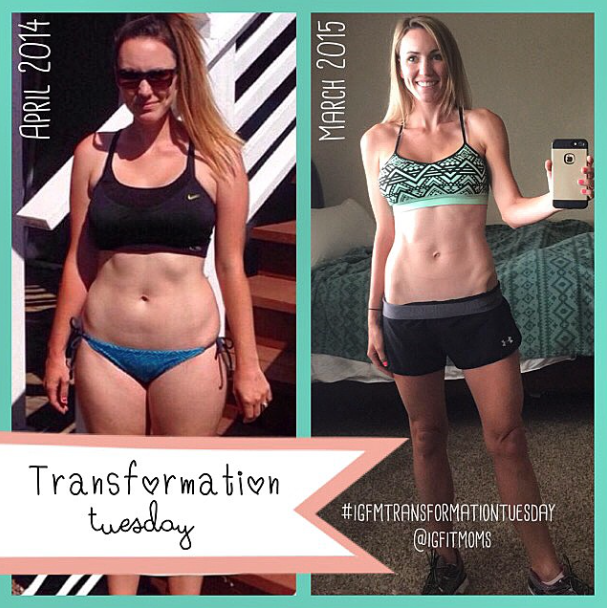 My transformation didn’t happen overnight. Since joining TIU, I’ve also dabbled with BBG, CrossFit, bootcamps, at-home style Crossfit, and random workout classes and activities along the way. I throw in a lot of my own workouts and programs into my daily routine, but commit to TIU 1000% during challenges. During TIU “off season” I dive into challenges with my BFF [best fitness friend], Shelby, where we host month-long fitness challenges. Find them in my Challenges tab above. Since last year, I’ve suffered from my chronic back injury flaring up quiet badly. 4 herniations, bulges, spinal stenosis, degenerative disk disease, and other ailments keep me from working out like I was last year. Although sometimes I feel like I’ve lost a part of me and my brand, I know this is just a temporary setback that allows me to focus on other important aspects of my life right now – there is more to life than losing five pounds. Life is all about balance. Finding peace, happiness, passions, and your true calling. Share your zest with the world, and the world will share its zest right back. I believe if you love what you do and you do what you love that success and happiness are inevitable. 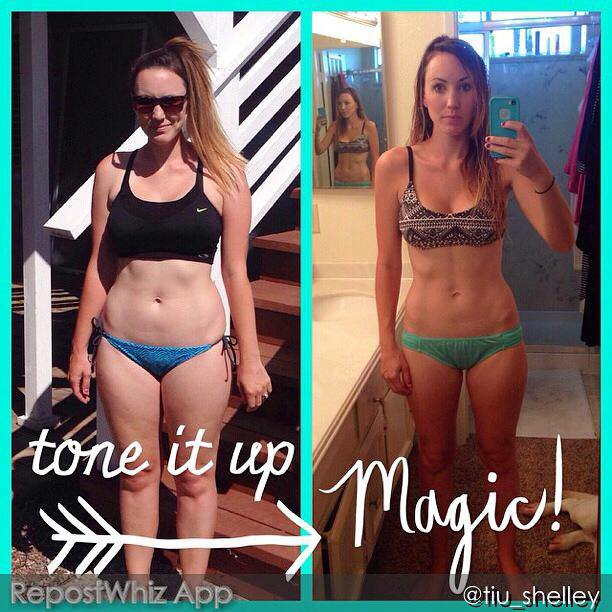 Tone It Up Instagram #repost and shout out for my Bikini Series Recap Video!!! Highlight of my life! Don’t ever be too busy building a life you forget to look around and smell the roses. So what do I do to live the lifestyle I live? I make it a goal to perform TIU videos at least 5 times a week. If I miss one because of a crazy day, I double up the next day. I always challenge myself to walk/wog/run 100 miles over an 8-week period. I set attainable goals. Start small and work your way up. If you have a list of 15 things you want to accomplish within the next month, pick your top 5 and focus on those. Once you hit those, move forward. If you set too many, too quickly, you’ll get way too overwhelmed and struggle to even reach one. I eat healthy. I try to stick to the motto “lean, clean, and green.“ Like I mentioned earlier, I eat 5-6 small meals a day. Breakfast, a mid-day snack, lunch, an early-evening snack, and dinner. If i don’t have a mid-evening snack and am up late, sometimes I have a healthy “dessert” like a piece of fruit, flavored greek yogurt, and/or a cup of herbal tea with raw, organic, local honey. Think I’m crazy? The first time I heard someone say a piece of fruit satisfied their sugar craving I thought they were a complete psychopathic nut job! I visualize. Make a vision board of where you want to be in life in the future; it can be anything from a cute outfit you want to buy, new recipes you want to try, hitting a milestone (buying a house, getting married, getting a new job, getting pregnant, etc.). But don’t forget about the present. Live in the now, enjoy this moment right here, right in front of you. Don’t ever be too busy building a life you forget to look around and smell the roses. BE YOU. RIGHT NOW. It’s never too late to be a better version of yourself. If you’re ready to commit to you, you can do this. The journey of a lifetime truly does begin with one.single.step. Jump, girl! You’ve got this…I believe in you! I have been following you on IG since I started with TIU in October. I will have to say I love seeing your posts!!! It is so motivating to see how much Sea Shells and Sits Up has grown and how you have stayed true to who you are. Love all of it! 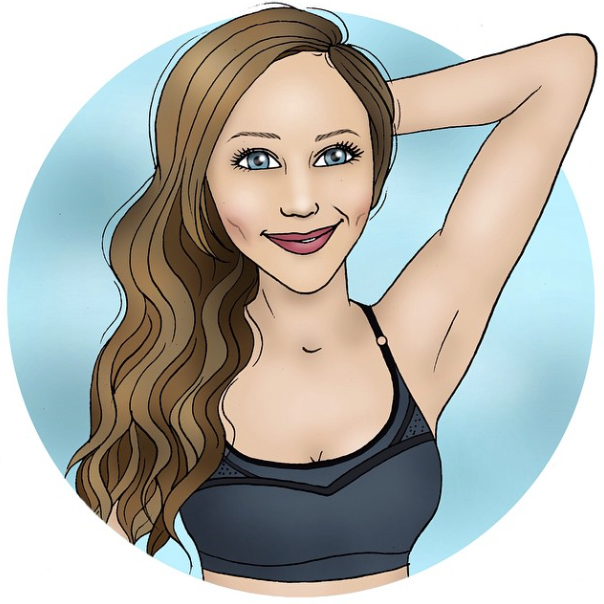 I am kind of looking into starting a fitness blog and I absolutely LOVE yours. I follow TIU as well (that is how I found you), and I think this is amazing. Do you have any advice? Or helfulp hints?? I would love to chat with you. You can email me at lindseyblust@gmail.com or find me on Facebook! I was searching for new ideas to spice up the next week of my challenge group and found your blog. I love it!! Great material! Can’t wait to read more! Shelley! This is so sweet. I love the way your personality shines through your writing, and I really appreciate that you’re showing women that you can live a balanced lifestyle, eat normally, and look like a Sports Illustrated swimsuit model all at the same time. I’ve been a TIU member since fall 2012, but wasn’t ready to finally take on a challenge until this fall (I’m slow). This year’s Holiday Hunny challenge will be the first one that I’ve really followed through on. I’m so amazed by the potential this community has to empower people, and you’re definitely contributing massively to that empowerment force. Thank you for sharing your beautiful energy! Can’t believe I just now discovered your blog! Love your instagram so this is bliss! I have been slowly, but surely, getting more and more into Tone It Up. I am a Nutrition Plan member and have been for awhile. I am wondering if you have advice for staying on top of things…what do you do to hold yourself accountable? I will get so excited about Frisky Fall or the Bikini Series but by week 3 I totally fall off. Did making the TIU instagram account help? I follow so many TIU sisters and am totally inspired all the time but at the end of the day, when I am so exhausted, I allow myself that one little reprieve. But it isn’t doing anything for my health!! Thank you so much and thank you for sharing so much with all of us out here who are feeling a little lost! You are a great inspiration! Its wonderful to be following your fitness journey. Fitness is probably my hardest thing to stick to, but I have been following ToneItUp for a while, and even though on and off, I have stuck to it rather than just not doing anything what so ever. Hopefully I will progress further into full on fitness/health dedication as you. I might be crazy but I can’t find your email address! ha! PS: I’m Shelly, too. Not Michelle! 😉 @Shelly_TIU on insta. Aww i love your story and the journey you riding on!!! You help us all get inspired! So happy to have finally gone on your blog and see your back story from instagram..i love you, and cant wait to see what the future bringd all us tiubabes! Awww, you are the sweetest!!!! Thank you, Ash!